Christmas 2018 at Union Station in Washington, D.C. If you're traveling to Washington, D.C. this Christmas season, you might consider getting you and your family in the holiday spirit by taking in the sights and sounds of Union Station's well-decked halls and festive events. This train station and upscale shopping mall feature entertainment throughout the season to appeal to all ages as well as a special holiday train display in the West Hall that's sure to delight the whole family. Union Station is one of the best venues for holiday shopping in Washington, D.C. not only for its variety of wares but the historic building is also festively decorated each year with its large wreaths and thousands of twinkling lights as well as the signature Christmas tree. The centrally-located tree is a gift to the people of Washington from Norway and a symbol of the friendship between the two countries; the tree symbolizes Norway’s gratitude for help received during and after World War II. Additionally, the Christmas Tree Lighting ceremony has been a Washington, D.C.
tradition each holiday season since 1997. There are also plenty of great dining options ranging from casual eateries at the food court to fine dining at restaurants such as Thunder Grill and Legal Seafoods, making Union Station a place you could easily spend the whole day this holiday season. 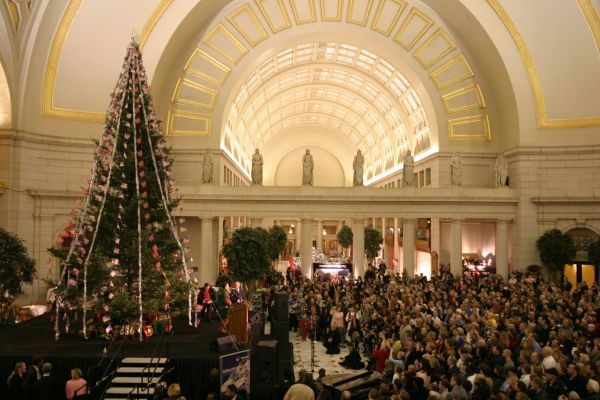 There are a variety of ways to get in the Christmas spirit at Union Station this December, including a Toys for Tots drive, a holiday model train display, and the annual Christmas tree lighting ceremony. Events kick off on December 2, 2018, with the 22nd annual Tree Lighting Ceremony, which will take place at 6 p.m. outside the Main Hall. The Ambassador of Norway, Wegger Chr. Strommen will light the 32-foot Christmas tree while the Children's Chorus of Washington—representing over 100 schools in the region—perform holiday songs. The tree will be decorated with hundreds of custom-made polar bear ornaments, and visits from Santa Claus will also be part of the event. The U.S. Marine Corps Reserve "Toys for Tots" campaign delivers a new toy and provides a tangible sign of hope to economically disadvantaged children at Christmas, which was founded in 1947 when U.S. Marine Corps Major Bill Hendricks and a group of Marine Reservists in Los Angeles collected and distributed 5,000 toys to needy children for Christmas. In 1948, the program expanded and became a nationwide campaign, and Union Station is now one of the top collection sites for the program in the nation's capital. Collections will start on November 23, 2018, and last until Christmas Eve. The Norwegian Giant Model Train exhibit will be on display in the West Hall at Union Station delighting visitors of all ages. The trains are hand-made replicas of real Norwegian trains, which have been crafted by an expert model builder and set in a Norwegian landscape of mountains and fjords. You can view this special exhibit every day in December—except Christmas Day when the venue will be closed—from 10 a.m. to 7 p.m. Mondays through Saturdays and from noon to 6 p.m. on Sundays. Union Station is a transportation depot as well as one of the largest shopping venues in the nation's capital. It is located at 50 Massachusetts Avenue Northeast in Washington, D.C. and has a Metro stop on the Red Line. The historic building is located north of the Capitol Building and northeast of the National Mall, and it is within walking distance to many of the most visited landmarks in the nation's capital. Union Station is the rail station for Amtrak, MARC Train (Maryland Rail Commuter Service), and VRE (Virginia Railway Express). Retail Hours are Monday to Saturday, 10:00 a.m. to 9:00 p.m. and Sundays from noon to 6:00 p.m. The station will be closed to the general public nightly from midnight to 5 a.m. but commuters can still access the station with their transportation tickets. Parking is available on-site in a parking garage with more than 2,000 spaces, which is open 24 hours a day, seven days a week. Additional parking can be found nearby at other famous landmarks as well as a limited number of metered street parking spots.